For businesses of all sizes, gaining the trust of customers is an essential - and sometimes difficult element of selling online. Shoppers want to know who they’re doing business with, and they want to be reassured that they’re going to receive excellent service and high-quality products. Luckily, Bonanza’s Booth Tools are designed with this in mind and with the aim to help you build your booth, brand, and sales. When a shopper enters your Bonanza booth, you have the same opportunity to connect with them and promote your products as you would if you had a brick-and-mortar store. Whether you’ve been Bonanzling for years or are a first-time seller, here is the run-down on how to use your Booth Tools to turn more browsers into buyers. Your profile is a great opportunity to tell shoppers your own unique story. Share your knowledge and passion for what you sell, ultimately convincing your customers that buying from you is a great idea. Give your shoppers plenty of ways to connect with you. Add your business’ social media accounts to keep your new fans up to date on your freshest merchandise and special promotions by easily linking and sharing your listings with them via Pinterest, Twitter and Facebook. 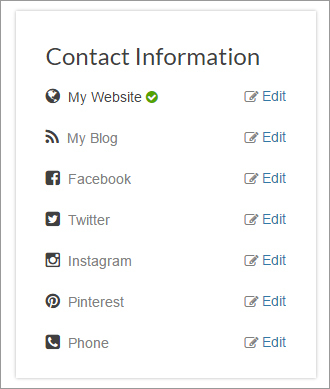 You can access your Profile via the Account dropdown menu on the upper-left hand side of any page. Your Booth Overview allows you to clearly communicate the value of your products to your customers and helps earn their trust. Fill in this section on your Selling > Booth Settings > Title & Overview page. Your booth’s Miscellaneous details section is the perfect place to address your customers frequently asked questions. Include policies not covered by your shipping and return section, special instructions, or any other information you’ve found is helpful to your buyers. A return policy is a great way to build a relationship with customers. Setting expectations can reduce frustration among buyers and cut down on returns. Also, if you're advertising on Google Shopping, you're required to have a clearly stated return policy. Make sure that whatever return policy you create in your booth matches any information that is already included in your item details. To create a return policy, hover over the "Selling" link located in the upper-left corner of any page and click the "Booth settings" link from the drop-down menu. The click the "Shipping & returns" tab. Scroll down until you see the "Return policy tab" on the left. Select the accurate policy from the menu given; if necessary click the "Add more information" link to add even more details. Under what circumstances do you accept returns (any reason, incorrect size, damaged item, etc)? What is your timeframe for returns (30 days, 60 days, 90 days, any time, other)? What kind of refund do you offer (full refund, credit, exchange, etc)? When can customers expect a refund (1-2 weeks, etc)? How should customers ship returns (pre-paid label from seller, at buyer's own expense, etc)? Build a strong brand presence with a customized Booth Banner. 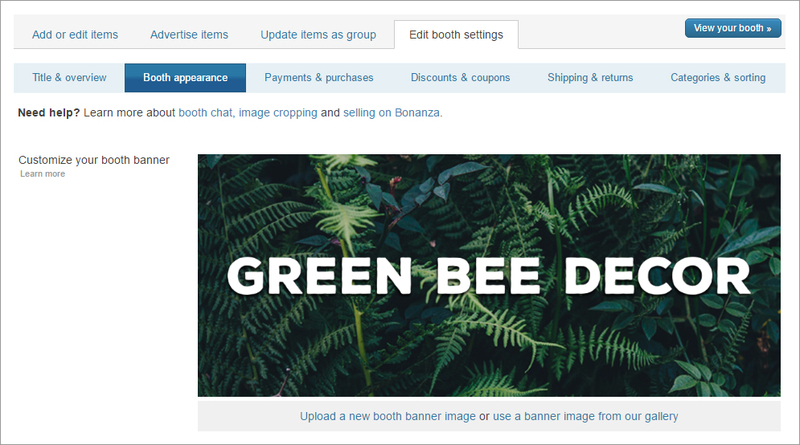 Whether you choose from Bonanza’s gallery of beautiful designs or upload your own, be sure to select a banner that visually represents your store and offerings. Set up your banner on your Selling dashboard > Booth Settings > Title & Overview page. Link your customizable booth panels to your most popular items, seasonal merchandise and any promotional markdowns or coupons that you want to promote to your buyers. Shoppers will see these attractive ads displayed above your listings. This exclusive pro-member feature can be found on your Selling dashboard > Booth Settings > Booth Appearance page. Encourage your shoppers to stick around your booth and shop a bit longer. Set up your Product Page Box so that your shoppers will be shown an ad for another item in your store or 8 of the most similar items to the one that they are looking at. This exclusive pro-member feature can be found on your Selling dashboard dropdown menu > Booth Settings > Booth Appearance page. Use your Real Time Chat box to greet your customers. Invite them to browse your booth and ask you questions. Alternatively, you can disable the chat function on your Booth Settings > Booth Appearance page if you’re unable to answer chat inquiries quickly. Add your welcome message on your Selling dashboard > View My Booth page. Bonanza is focused on providing sellers with the tools to build their dream businesses, and each of the features in your booth has been carefully created to help you build your brand and sales. Once you put these features into play, you'll be ready to welcome your shoppers into your booth with a strong brand presence that will turn more browsers into loyal customers!